President Uhuru Kenyatta with Ethiopian PM Abiy Ahmed attend the Kenya-Ethiopia Trade and Investment Forum in Addis Ababa on March 1, 2019. Kenya and Ethiopia have renewed their commitment to implement joint infrastructure projects as key enablers of the two economies. 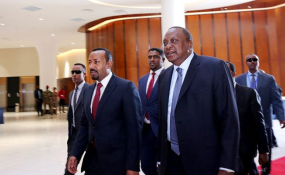 President Uhuru Kenyatta and Ethiopian Prime Minister Abiy Ahmed said that the regional mega initiative, the Lamu Port-South Sudan-Ethiopia Transport Corridor (Lapsset), is central to the unlocking of the economic potential of the entire East African region. The Lapsset project includes building of railway, electricity, roads and the Lamu Port. Speaking when they presided over the official opening of a two-day Kenya-Ethiopia Trade and Investment Forum in the Ethiopian capital Addis Ababa, the two leaders promised to deepen trade and economic ties between the two countries. "In my mind, the Lapsset project has great promise of transforming our countries and improving the living conditions of our people," President Kenyatta said. "Kenya and Ethiopia resolved to partner in developing first class infrastructure projects connecting our great nations and the continent. By this I have in mind the Lapsset project which Kenya is, for sure, still fully committed to," he added. President Kenyatta is in Ethiopia on a two-day official visit at the invitation of reformist Prime Minister Abiy. Top on the joint infrastructure initiatives is the Moyale Joint City and Economic Zone project. The two leaders called for the fastracking of the ongoing transformation of Moyale town into a cross-border trade hub in the region in line with the 2012 Special Status Agreement (SSA). "Our strengthened collaboration in cross-border trade and investment is crucial for the overall development. In light of this, we need to accelerate plans to transform the Moyale Region into a commonly administrated economic hub of East Africa," Dr Abiy said. The SSA, signed in November 2012, is a framework of collaboration between Kenya and Ethiopia, and was the enabler for the Moyale-Addis Ababa highway, the One-Stop Border Post at Moyale and several other joint initiatives. "The realisation of the free trade zone in Moyale will not only transform the two countries but also create enormous job opportunities for our young citizens," President Kenyatta said. The forum in Addis is attended by more than 400 Kenyan and Ethiopian business leaders. Among the Kenyan companies are regional lender KCB Group and giant telco Safaricom, that have previously expressed interest in investing in Ethiopia. Others are Equity Bank, SportPesa, Magnate Ventures, and Mount Kenya University. Mr Kenyatta invited the Ethiopian private sector to invest in Kenya. "The Big 4 Agenda, on Food security; Affordable Housing; Manufacturing and Affordable Healthcare offers concrete investment opportunities, and I welcome the Ethiopian private sector to partner with us," President Kenyatta said. Dr Abiy said Ethiopia was open to Kenyan investors and called for the strengthening of trade relations between the two countries. "Opportunities are now wide open for Kenyan companies to invest in energy and aviation in Ethiopia," he said. "Similarly great potential awaits Kenyan investors to explore our agro-processing, textile and garment manufacturing throughout the country," he added.